How Do I Shut Off the Water to My Home? You are here: Home » » For the Homeowner » How Do I Shut Off the Water to My Home? A pipe is leaking, spewing out water into your home, and you need to know where to go to shut off the water to the home. I have seen inspection reports where the inspector could not find something, so he had to state that fact on the report. The problem becomes that the next inspector easily finds it, so you are left wondering why the first inspector did not look for it better. I had an inspection where a water heater was in a nook in the garage. The homeowner had built a shelving unit in front of it. It took me a moment to realize that fact. On another inspection, I knew that the water was coming from a pipe located under an alley behind the house. I could not find the meter though. There were boxes for meters, but they were not installed. I started to consider the possibilities, so I walked through the neighborhood. 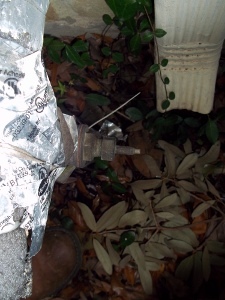 Finally, I waded through the chest high bushes that were ten feet deep in the backyard, and I found the water meter. You may be asking yourself as to why was this important. Maybe for most homeowners it is not, but you should know where it is, because the water meter has a valve that could be needed if you have a pipe break, so the water has to be turned off. Sinks are nice. They have the valves underneath them to shut off the water supply when we are working on the faucet.Many other plumbing fixtures have these valves. I have seen some builders have separate water shut offs for other plumbing fixtures where I did not expect them; however, tubs and showers are commonly left off of this list. The exception lies with the homes that use PEX tubing. The common method for installation is to have a manifold that has the valve controlling water flow for each plumbing fixture, including showers and tubs. Yet there is still the concern with the water before it reaches the manifold or even the house.I accidentally hit the water supply pipe when working in a garden thirty years ago. I will never do that again. In that case, I had to know how to shut off the water at the meter. The picture above is of the valve stem for the water shut off in a townhome. Your home will have a valve to do this before the water can travel through much of your house. In many homes, this valve will be on a pipe coming up from the ground to a hose bib. Many homeowners cover that valve with insulation to protect the pipes from freezing. The hose bib is what they use, so the other valve is forgotten. In the picture, the valve stem should have a handle to make the valve easier to operate. Pliers will do, but you will want the handle when the emergency arises. This valve stem is for the handle that you find on hose bibs, that round wheel. On my home, the valve has a lever handle to distinguish it from the hose bib. If you valve is not by a hose bib, then it is in the house (if you have one). Most of the time, you will find them in the garage. They will have a little panel of door in most cases, but there could be a cut out in the sheetrock. However, these valves can be located in other rooms too. The builders will place the valve in the wall closest to where the water supply enters the house, so I have found them in dining rooms, bedrooms, and utility rooms. I encountered one situation where a previous homeowner did not like the look of the door to the valve, so he walled over it. A leak caused the next homeowner to discover it. There are homes that do not have a water shut off valve. When this is the case, then you do need to know where your water meter is located. For the majority of homeowners this would be on the easement near the street. In neighborhoods with back alleys, these alleys could hold the water supply, so the water meters were near the entrance to the property from the alley. 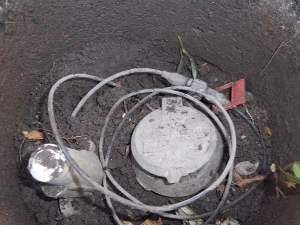 Newer water meters have a sensor with wires leading up to the coverplate. This is the type that can be read by the utility company, without having to look at the meter gage. Makes their work go faster. Where the wires connect to the pipe, or where there is a gage, you will find a handle that has a hole in it. The top of the handle has a rectangular piece of metal on top. This is the valve handle. When the hole from the top part is over the hole from the bottom part, your water will be off. The holes are for a padlock to prevent the water from being turned on. There is a special wrench for this handle. A long metal T with a fork shape at the base end is the best way that I can describe it. However, you do not need this special wrench. Any wrench will do. I am able to use a small pair of needle nose pliers that I carry in my pocket during inspections. When the valve is harder to budge, I use a crescent wrench. There are two common situations that I face when inspecting water meters that can cause a problem. When there are heavy rains, I have found the water meter box to be full of water. With the dirt, the water becomes clouded, so I cannot see what I am doing. You never know what might be in the box. The other situation has been a build-up of dirt over the valve, so everything has to be cleared away to work on the valve. Not what you want to do when you are in a rush. Hopefully you will never need to turn off the water to your house in an emergency. I had a problem with a bath tub valve, so I had to turn off the water to replace a seal. I wish that I had an individual valve at that time. You have to drain the water out of the pipes to prevent water from spilling on you, then you had to get the air out of the pipes when turning the water back on. Not hard, but an annoyance. I would suggest that you know where your valves are in case of a leak. This entry was posted on Monday, February 7th, 2011 at 4:00 pm	and is filed under For the Homeowner. You can follow any responses to this entry through the RSS 2.0 feed.